The 920M Plus handheld pulse oximeter provides on-the-spot oximetry readings, and are designed to be easy to use for both healthcare professionals and patients. They feature a bigger display, better performance and a 72-hour memory. The soft, rubberized cover slides away for easy access to batteries, and may be used with a wide variety of finger and ear sensors for adult, infant and neonatal patients. New Design is smaller, lighter and easier to carry. 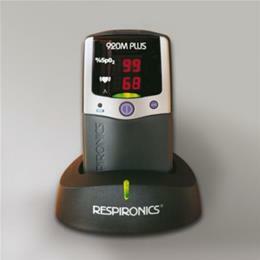 Larger Display is easier to read and harder to confuse oxygen saturation and pulse readings. Two Button Operation is easy to use and enables you to control all functions. Expanded Memory up to 72 hours provides the option for longer studies. More Efficient with four AA batteries instead of six for 100 hours of use. Profusion Light indicates a proper connection - when it lights up, you're recording. Full Line Of Sensors are compatible with sensors for 920M model. Battery Light gives you a clear indication of battery condition. Optional NIMH Rechargeable Battery System provides cost-effective operation and flexibility with power options.